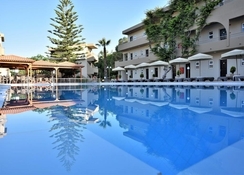 The Marathon hotel in Kolymbia, Rhodes, is a family-friendly 3-star hotel. This resort offers all inclusive rooms prefect for families and couples that want to experience all that this lush island has to offer. The Marathon hotel is just over a mile from the nearest sandy beach, and provides easy access to Rhodes Town – perfectly located for those wanting to explore. The central location also means it’s near Lindos, a town that boasts a lovely bay worth visiting. The hotel has swimming pools, bars and sports facilities for guests to enjoy. Also, there is live music regularly alongside indoor and outdoor dining. The nearest airport is close by so it’s just a 45-minute transfer, again making it very convenient for guests. There are coffee shops as well as lounges and snack bars for guests to use throughout their stay, in addition to the free Wi-Fi in public areas. The Marathon hotel is ideally located in a central position in Kolymbia, with the beach just 1.84 miles from the resort, so you can easily stroll there from your hotel and spend the day on the sand. The Tsambika Monastery and Beach are also both less than 2 miles way, so if guests fancy visiting a different beach or to see some of the history of Rhodes then they can. Also, Afandou Golf course is a great place to visit if you enjoy a bit of golf whilst getting a sun tan as it is only 3.57 miles away from the hotel. This hotel has a variety of room types including Single Rooms, Double Rooms and Family Rooms so it’s perfect for couples or families to enjoy. There is a total of 115 rooms available for guests. Each of which are nicely decorated with plenty of space for guests. The rooms come equipped with a private bathroom, phone, shower, TV with satellite connection, a fridge and air conditioning. There are also balcony’s in each room. The main restaurant offers a buffet style service and it’s open for breakfast from 07:00 to 10:00, lunch buffet from 12:30 to 14:00 and a dinner buffet from 18:30 to 21:00. Drinks like spirits, beer, juices wines and soft drinks are available from 10:00 to 22:30 in the pool bar and cocktails are served from 18:30 to 22:30, also at the pool bar. The main restaurant has an indoor and outdoor section for guests to use. 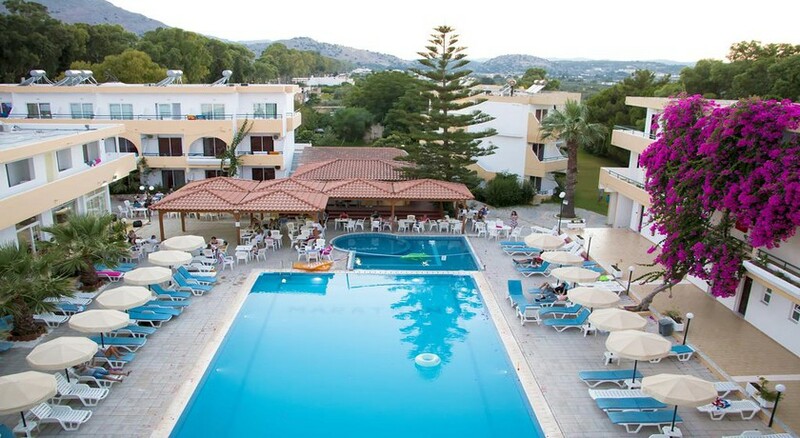 This hotel has so many forms of entertainment, starting with the Greek themed night that runs from June to September, featuring spectacular live music, this runs on a weekly basis throughout key summer months. There are swimming pools and air hockey as well as billiards for guests to use and play with whilst enjoying their stay. In addition to this, there is a games room, kids’ pool and kids’ playground, so there is something for all ages to enjoy. Maid service is provided every day and bedding is done every other day. Unlimited ice creams is served everyday between 3P.M and 5P.M. Shops and restaurants are a 5 minute walk and only 50 meters away. Given that we have been to Greece 3 or 4 times previously we knew what to expect, but all inclusive shouldn't mean that your drinks should stop at 22.30 and the long queues we experienced to get those drinks in the first place. A really nice hotel, nice staff, reasonable quality food, if not great quality entertainment. We went in july the weather was gorgeous. The hotel was nice enough, you get what you pay for . There was a good selection of food, even for vegetarians.